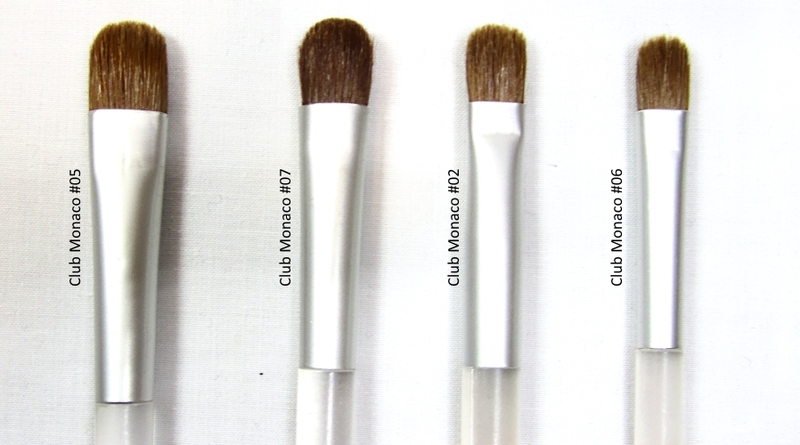 I briefly mentioned my Club Monaco #02 eye shadow brush in my brush stash post. I called the brush as one that I would run back into a burning building to rescue. What makes this brush so special is that not only is Club Monaco Beauty no longer available – making this brush somewhat of a collector’s item – the quality of this brush is outstanding. I’ve had this brush for at least 10 years and it has retained its shape and all its hairs. The bristles are of natural bristles (in fact, back then, good quality synthetic brushes were a rarity) with a sleek frosted lucite handle. The shape is a classic eye shadow shader, with densely packed hairs and a slightly tapered tip. The most unique aspect of the CM brush is the narrow shape – around 1.0cm wide – and its firm hairs, making it perfect for packing on powder eye shadow onto the lid. In recent years, I began looking for brushes with similar shape so I could have a rotation of shader brushes. The closest I’ve ever found were from Bourjois (which then I prompty bought 5 as back-ups) and Sephora (Pro Small Shadow #15) – but neither have as firm hairs as the CM. I’ve placed the MAC 239 Shading brush and Shu Uemura Natural Brush 10 next to them for comparison – both of them are much wider than the CM, however, the Shu brush does have a similar firmness as the CM. My favourite of these is #06 since it is the most similar to my original #02. The #07 brush has different hairs than the others – softer – and is my least favourite since it doesn’t pick up eye shadow as well. Do you have any “run back into a burning building” beauty products? good luck finding more brushes! I believe in you! How great that you got more off eBay! 😀 That looks like a great collection of just the CM brushes. I myself only have a CM powder brush (which I still use practically every day) and a lip brush (I don’t use this much, but it’s a great lip brush). Oh, and a pencil sharpener. I wish the lipsticks were still good. I loved Glaze (think I went through 2), and a few others like Beam (which was similar to the old UD Bruise that was purple/green…I think it was Beam, anyway). I actually rediscovered one of my CM cream eyeshadows. It’s Pewter and OMG it is still good. Crazy. Wish they’d bring back the line. They had nail polish, too, though it was the weakest CM product I tried. My friend gave me an eye grease and cream blush from CM but being a makeup newbie, I did not appreciate it and gave them away. That’s awesome that you found a listing on eBay for those! I’d be pretty depressed if my J210 was gone forever. But you could replace it. I get panicky when things are discontinued or LE and irreplaceable! Bay can really surprise you sometimes 😀 Not gonna lie, I’ve never heard of these brushes, but your ‘go to’ 02 reminds me a bit of the brush that comes with Urban Decay Naked Pallet. It’s hard to say from the picture how close it is, but you can maybe have a look and compare if you’ve never tried one? (I might be completely wrong btw 🙂 ). Hope your luck doesn’t run out and you find more of these! GOD! I worked at Club Monaco when Monica Lewinsky gave that infamous interview wearing the awesome Club Monaco Glaze lip gloss. We could NOT keep that stuff in stock…and then it ran out and they eventually discontinued the makeup line. WAHHH!! They also did a lip gloss called Sugar that was immensely popular…. Great post! Oh wow, you were right in the front lines! I remember that lip gloss! It was a frosty peachy champagne shade! I loved the frosted tubes of those glosses! Club Monaco was really well-priced until it was bought out by Ralph Lauren. That’s when the prices sky-rocketed. The quality is quite good though. You’ll pay a lot for the clothing, but it will last a long time. I agree, the prices are a little insane nowadays. My wardrobe consisted of a lot of CM stuff at one point (the clothes lasted for years) but now I don’t shop there as much unless there’s a sale!